Pupil Premium funding in 2012-2013 was targeted at specific groups of pupils in order to provide additional support and resources to narrow the attainment gap. 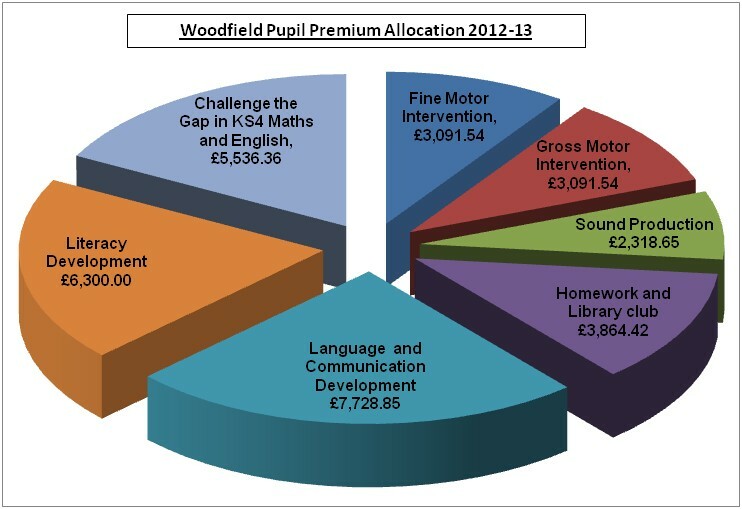 At Woodfield Pupil Premium is dedicated to raising our learners' inclusion, future independence and academic attainment. To maximise impact, focus areas are determined by the Senior Leadership in response to current and future pupil need. All funds are allocated to Intervention and support programmes. These are targeted to overcoming barriers which are impacting learners their academic, social and vocational potential. All intervention programmes are designed and overseen by specialist internal and external professionals and middle leaders. They are carried out by Specialist Teaching assistants, with regular oversight and support from therapists, curriculum leaders and the Senior Leadership Team. All Pupil Premium Funding is allocated to staffing Intervention and Support for our Learners.